American Angler has come up with one of the most powerful electric fillet knife, with multiple utilities and benefits. These are different from the traditional kitchen knives as the filleting needs to be done with a stronger and sharper blade. The strength and power obtained by the electric knives helps fillet items like fish very smoothly to cut through their backbone like cutting a cake and that too without being bent. 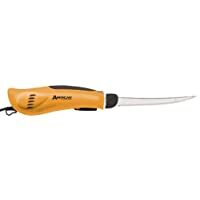 American angler electric fillet knife is one of the best filleting knives to serve your cooking needs. 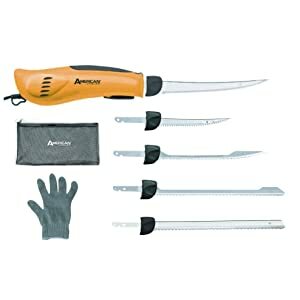 American Angler Pro electric fillet knife comes with additional power due to its advanced and enhanced levels of gear and motor systems. These systems provide additional torque, which is two times more than the previous filleting knives. It is powered by 110 volt that helps achieve smooth and consistent fileting in just no time. The complete structure of the device has been developed keeping in mind its suitable ergonomics so that when it is held in hand, it fits right into it without giving any strain. The knife storage is not an issue at all as it comes with a convenient and appropriate carry bag with proper vents so that the odor doesn’t get permanent to it and also the device remains free from rust. The new motor and gear used in American angler fillet knife gives it optimum power and strength to finish fileting task in just no time. Carry bags facilitates easy storage and also avoids accumulation of odor or rusting that elongates the life of the product. The torque is two times more in the American angler electric fillet knife which makes it easy to twist and turn. The trigger switch is slightly weak and not very smooth to be used frequently. Since the switch is not smooth, even if you leave the knob, the knife is still on which can be dangerous. Many people have bought this knife and are happy with its power and strength. But due to the unsafe nature of the switching knob, many users have raised questions on its safety issues. Also, many users have claimed that the product is priced higher as compared to the utility and benefits it offers. This knife is a powerful fileting knife and executes cutting tasks very smoothly and on a faster pace. There are some safety and usage constraint when it comes to its switching knob, but they could be repaired by the company when in warranty without any hassles. The product is placed on a higher price level due to which many people do not think it is affordable, but the high power of motor and gear tends to make it slightly costly. In all, the device covers many of the requirements satisfactorily.